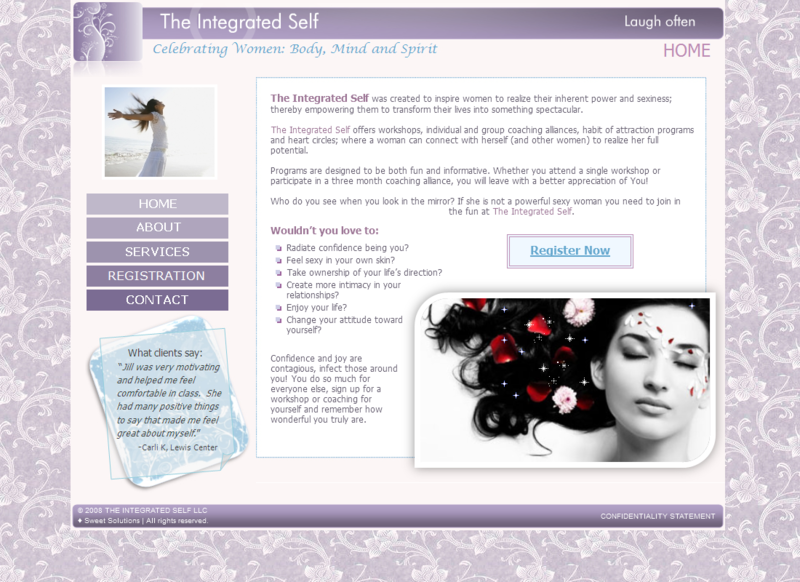 The Integrated Self was specifically designed to promote my client’s services and provide online registration for her programs. Jill Foster offers workshops and coaching to inspire women to realize their inherent power and transform their lives into something spectacular. Because Jill’s target audience is women, I designed the website to have a soft, feminine look . . . easy to do with a pale lavender lace background for the pages and shades of lavender and pink with powder-blue accents for the color scheme. Navigation, appearing in the left sidebar on all pages, is clear and has dynamic rollover effects for added flair. Other special features include a flash banner, custom slideshow, and a deluxe registration form that allows people to sign up for one or all four of Jill’s programs while automatically totaling the amount for PayPal.